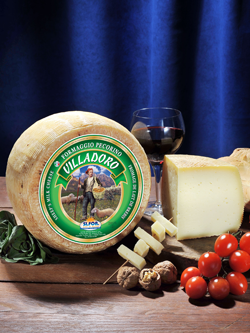 Pecorino Villadoro is a typical semi-aged table cheese, which is produced in the mountains with milk coming from sheep that feed on natural grass pastures. This wonderful Pecorino you are unlikely to forget is obtained after approximately 4 months of slow and natural ageing,. Its flavour is sweet and slightly tasty, typical of sheep’s milk. It is ideal as a table cheese and it pairs well with fruit (especially pears).